You know how sometimes you crave a curry, well I had that last week. So we went for a curry and ate out to avoid the house smelling like an Indian restaurant. That's how I chose the recipe I'd cook this week. 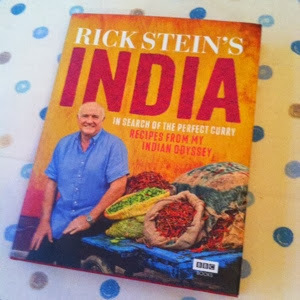 That, along with my new Rick Stein's India cookbook and knowing I had half a kilo of lamb in the freezer! 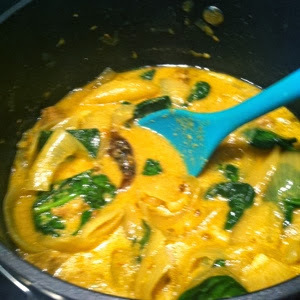 I was a little wary of this recipe because naughty Rick hadn't included a picture of what it should turn out like. However having eaten one or two Lamb Dopiazas in my time I forgave him. Mostly because unusually for a curry the ingredient list wasn't as long as your arm and the method was three lines long and can be summarised as "put everything in a pot, stir, bring to the boil then simmer for two hours." 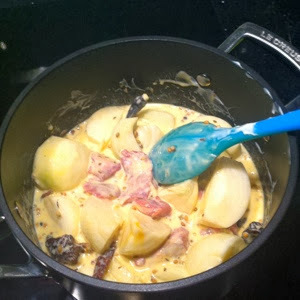 It really was that simple, I will at some point during this challenge no doubt pick a right corker of a recipe but for now I'm on one-pot wonders! As you can see it started off quite pale - the liquid is 500g natural yogurt and 250ml water. Aside from these, the meat and spices you'll need a kilo of onions, quartered. But as the time went on the colour, and flavours developed. The sauce stayed quite thin though and didn't look like it would ever thicken as described in the brief recipe. So I took things into my own hands and used some cornflour mixed with some of the cooking liquid to give it some help. I added some spinach, just before serving so MOH wouldn't question the lack of greenness on his plate (and it worked again!). 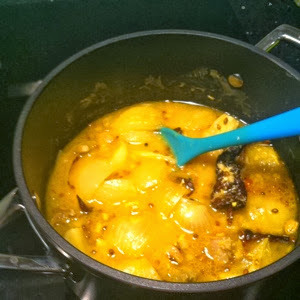 This is a great curry (despite the thinness of the sauce), it had a beautifully delicate flavour and sweetness from the onions. There was heat too, and this developed as we continued to eat but was never overpowering. I'd cook this again as it's impressive but very, very easy! 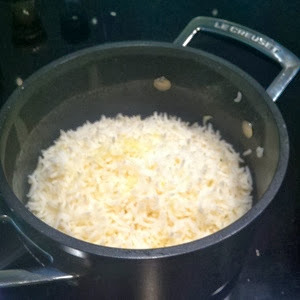 And as this recipe was sooo easy I cooked some proper, fluffy basmati rice to accompany the curry. 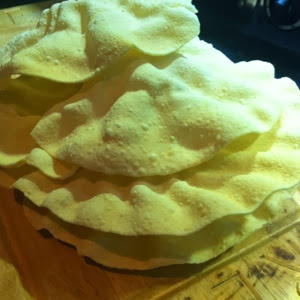 As well as a mountain of poppadums! Cooking these in the microwave is addictive - I love watching them spring to life as the heat hits them.